The One Laptop Per Child project is a sprawling initiative with immense potential to improve education on a global scale -- if implemented properly. We at OLPC News do our best to celebrate what is going right, question what is going wrong, and suggest what could be done better. Cute pictures of children with shiny new laptops don't keep us from asking tough questions. With this open-eyed view, OLPC News is a recognized voice in the OLPC community, even by Nicholas Negroponte himself. The OLPC News blog commands 5,000 readers a day, each spending an average of 4 minutes on the site, and the OLPC News Forum has almost 3,000 members and 22,000 posts on every OLPC-related topic imaginable. We recently announced that the OLPC project has entered the "Post-1CC Era" where most of the important action takes place outside of the OLPC Association's Headquarters located at 1 Cambridge Center "1CC" in Cambridge, Massachusetts. These days OLPC is really happening in the deployments and in local communities all around the world. We at OLPC News are doing our part to make sure that the OLPC project is "open, organized, and transparent," to quote Garrett Goebel's mail to the OLPC developers list. Christoph was one of the first members of OLPC Austria, a non-profit group based in Vienna, that supports the One Laptop per Child project via various efforts. Among other things he has co-authored the Activity Handbook, a handbook that helps people get started with software development for the XO-laptop. 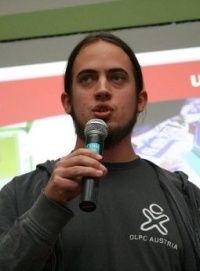 He has also held presentations on the OLPC project at various events such as Chemnitzer LinuxTage and CeBIT. Christoph is currently working on his bachelor in computer science at the Vienna University of Technology. He also spent the past few years running a Web site dedicated to small, low-cost and power-efficient computing solutions. His passion for computer technology, and his realization of technology's potential to change people's lives during a year spent in Peru, motivated Christoph to follow the OLPC initiative from the very beginning. He is generally located in Vienna, Austria but currently lives in Washington, DC. 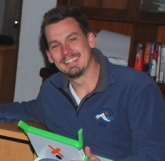 Bryan has been involved in OLPC since 2006 as a grassroots organizer. He was one of the founding members of the OLPC Nepal community and helped found Open Learning Exchange Nepal, the Nepali NGO that is implementing Nepal's OLPC pilots. Prior to coming to Nepal, he worked for 4 years in the Middle East and China on technology deployment for government agencies. His interest in education stems from his own experiences growing up with several learning disabilities and attending schools in the Los Angeles Unified School District, one of the worst performing school districts in the United States. He lives in Kathmandu, Nepal where he works as a systems engineer for OLE Nepal on Nepal's pilots at Bishwamitra and Bashuki schools. 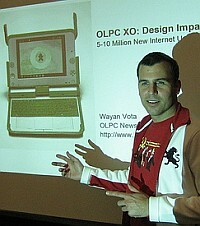 Wayan started OLPC News in 2006 to track the One Laptop Per Child program from a technology implementor's perspective. Since then, he's started the complimentary OLPC Talks and OLPC News Forum, and was a co-founder of the OLPC Learning Club DC. Wayan has coined the phrase "Clock-Stopping Hot" to refer to the XO-1 Hardware and "4P Computing" to refer to a new class of computing solutions for the developing world. He has commented on OLPC on 60 Minutes, the Economist, and numerous other mainstream media outlets. Wayan was director of Geekcorps, a Peace Corps for geeks, through 2007, and is now Senior Director of the Inveneo Certified ICT Partner Program, developing a community of ICT practitioners in the developing world. Wayan also consults with infoDev at the World Bank on low-cost ICT devices for education. Wayan lives in Washington, DC. Jon recently finished a graduate degree at George Washington's in International Science and Technology Policy, focusing on ICTs in the developing world. Previously, he served in the Caribbean with Peace Corps implementing educational IT projects while promoting free and open-source software. Jon is interested in that various ways mobile technology social media can be used for international development projects to improve knowledge sharing and access to information. He loves the XO hardware and believes that the global OLPC community will create (and share, of course) a functioning implementation plan that will really take advantage of the openness of the system. Lee has been designing electronic circuits and products for 35 years, including some of the first and most influential personal computer designs. Best known for designing the first portable computer (1981), Lee attempts to optimize the fit between the device and the user within society, applying concepts advanced by radical social thinkers like Ivan Illich ("convivality") and E.F. Schumacher ("intermediate technology"). In 2000 Lee developed the "Jhai PC" for rural Laos villages to access local and internet telecommunications. Called "the pedal-powered Internet" the design won Lee the prestigious Laureate of the Tech Museum of Innovation award. Lee is the co-founder of the Fonly Institute, a consulting product development company that specializes in systems usable in developing countries. Yama is the Regional Correspondent for Latin America, as a Bolivian/Uruguayan/Czech teacher who plans to devote his next season in life to serve others by making quality K-12+4 education available to all for free likely using ICT4D principles. He's starting with an Aymara village somewhere in the Andes and somewhat humbler goals. Yama lives in Austin, Texas, with wife Deb, getting ready to leave for Bolivia, ASAP, while taming his polymath ambitions. Mike Lee manages the OLPC News Forum and is one of the lead organizers of the OLPC-DC Learning Club. In his day job he manages Internet architecture for a large public interest group. Edward is the founder of Earth Treasury, an NGO to link schools around the world for education and business. Edward volunteers at OLPC as a volunteer coordinator, localization administrator (Khmer and Kreyòl), and general know-all. Charbax believes that video on the Internet is the next best thing to actually being there, and manages OLPC.tv, a site that features up to the minute videos about the One Laptop Per Child program. Alexandre is an interaction designer currently based in Rio de Janeiro, Brazil. He is particulary interested in issues of XO laptop usability. Combined, the contributors and commenters are the core of OLPC News, a core that would love to grow to you include you - the OLPC News readership. Don't be shy, speak your mind, in comments, as a contributor, or in confidence to us. It used to be said that failures breed orphans, successes breed fathers (I am paraphrasing). But in the Bloggosphere, success breeds children. "Across the developing world, education systems need to change dramatically to prepare their children for the modern world"
I witness the convoluted U-turns on education in my own country (they used to coagulate schools into "learning plants", now they go "small-is-beautiful"). And my country is not alone in Europe. So I do see some serious rethinking is needed in developed countries too. "OLPC News is a recognized voice in the OLPC community, even by Nicholas Negroponte himself." Where are the source of this claim? That is all for now, dismissed. "Yes, OLPC's commitment to Sugar has changed. It is now larger, not smaller. Contrary to inferences drawn by Walter’s departure, the press and venerable sources such as OLPC News, we are scaling Sugar up, not down. Let me explain." A contribution by all the brilliant computer brains are hard working for this project to make it a dream comes true. One laptop per each and every school going child is a long term investment and we really can't imagine that day when a village children can also connect to the scientist or technologist to share his or her Idea to make new technology.May be he could start his Technology Blog Like this and can solve schools home works.